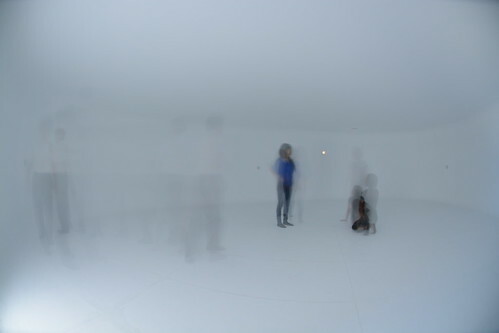 It's a void space dedicated for touching, hearing, and smelling. 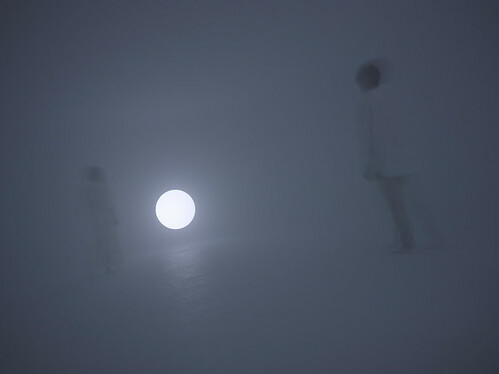 The architect Makoto Yokomizo designed a semi-dark space that makes you feel like "endless space that is vast and misty", and Maki Ueda made the scent diffusion system for it. As you walk into the space you cannot see at instance, then you automatically switch your priority to hearing, touching, and smelling. 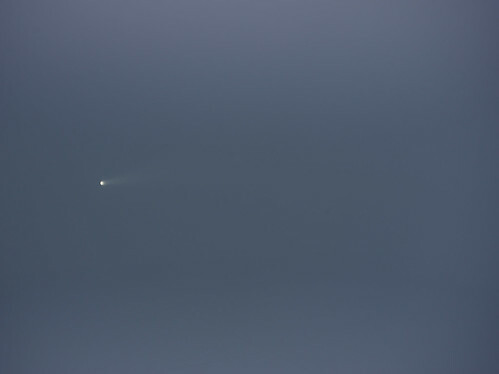 As you get used to the darkness you see no end in the space. 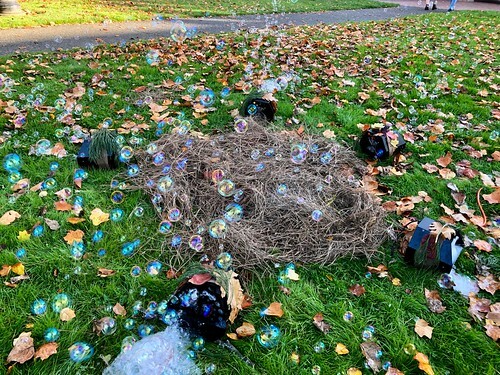 There's no object but an environment. 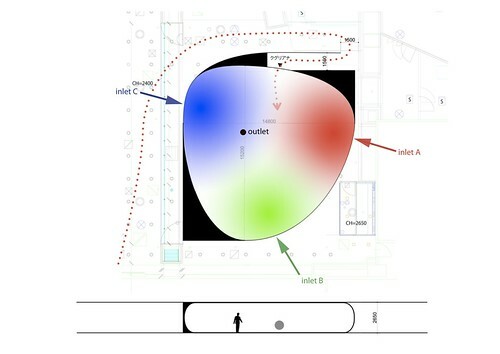 As you explore in the space you smell differently - 3 principle smells are used here like RGB for monitors. Thus, smells navigate you in the space. There's no meaning given to the smells, but it's you who give them. The focus is your sense of smell, movement, and orientation. Period: July 23 (TUE)- Aug 9 (FRI), 2013. 10:00-18:00. Organized by: Okamura Co. Ltd.
Support: Yamamoto Perfumery Co. Ltd. 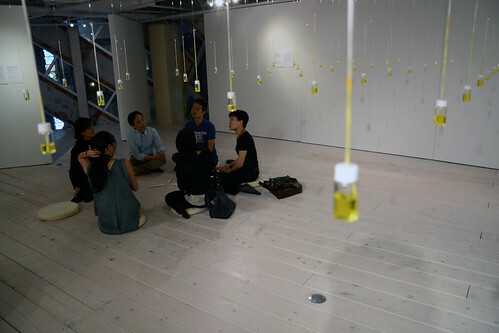 This looks like an installation with bottles hanging from the ceiling in a grid. 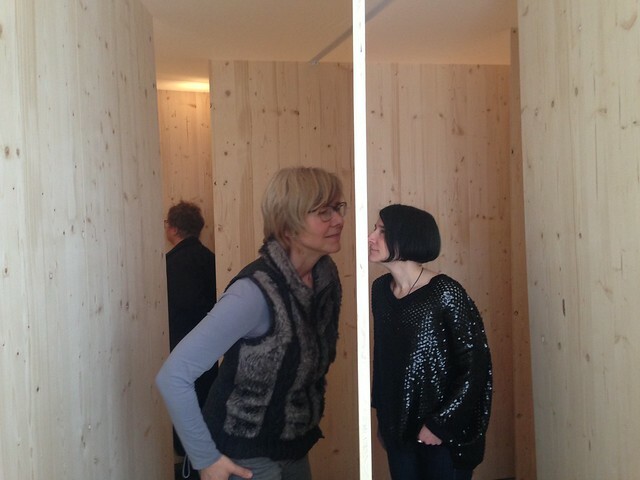 It is actually a space designed for olfactory exploration. Each bottle contains fragrant oil. 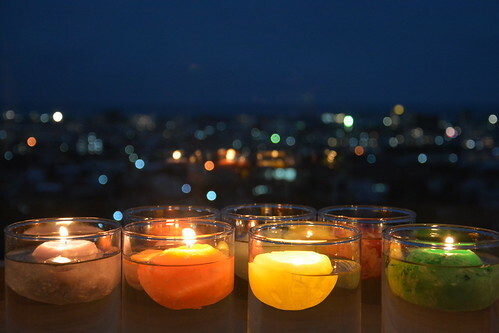 The candle rope by which it hangs from the ceiling gradually absorbs the oil and spreads the scent around the space. The oil is just strong enough to be smelled from a 20-cm distance. 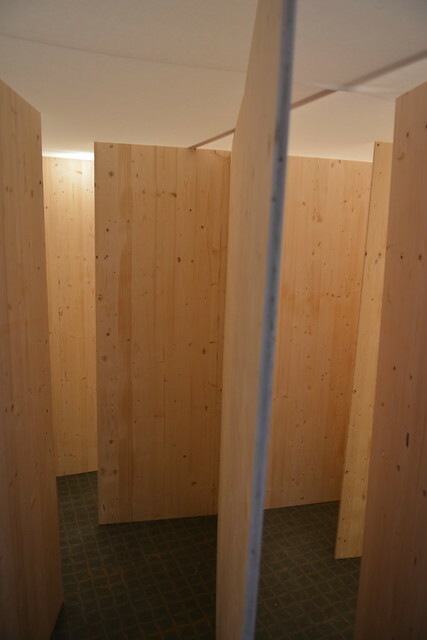 Each grid is about 40 to 50 cm, just wide enough for a person to walk through while smelling. Three different fragrant oils are used, and they are placed in such way that a person can trace a smell from bottle to bottle. They are placed in clusters or in lines, like a Reversi game. 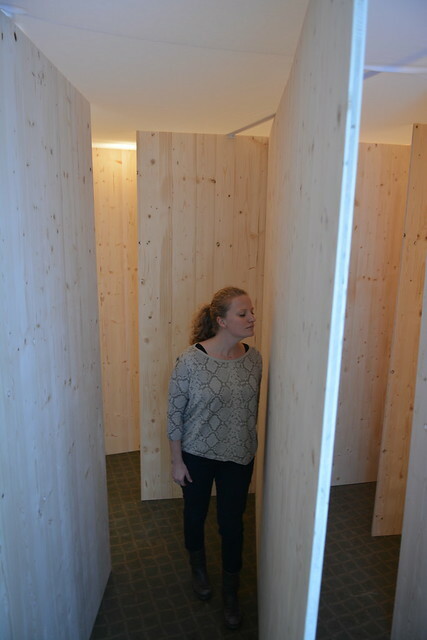 It's a small, playful "olfactory labyrinth" that also tests your sense of smell. 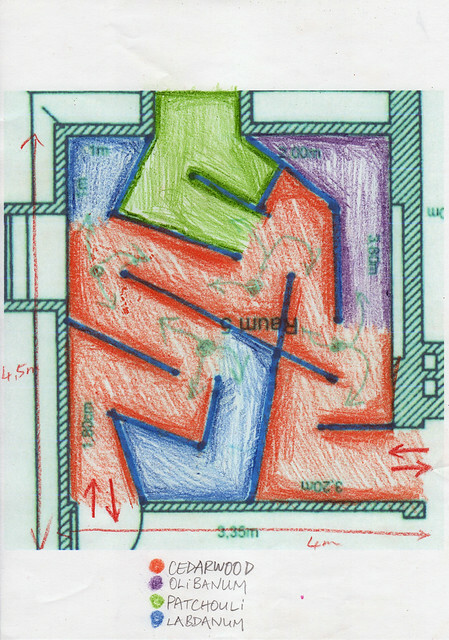 The construction is flexible, allowing the level of complexity to be adjusted to any target group during exhibition. 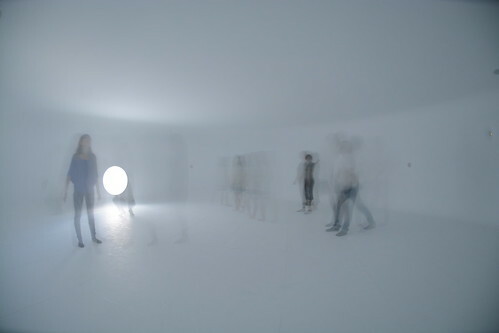 In this way, it is a platform for experimentation and there is no final, fixed form. The main focus is the olfactory experience rather than the scent itself. 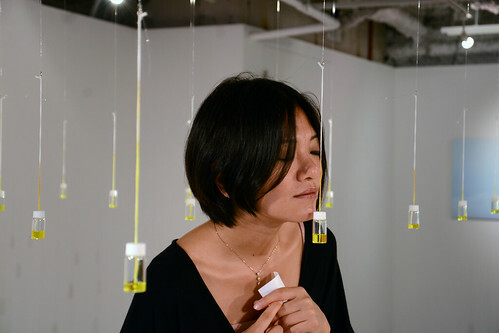 Often in olfactory installations or exhibitions, the focus is on guessing a smell or evoking memories and feelings. I think, though, that smell is, in itself, neutral. It's the audience who attribute meanings such as "I dislike this smell" or "This is the smell I knew from my grandma's house" after processing olfactory information in their brains. My memories are different from yours, so how can I assume that what is a "sweet smell" to me will have the same meaning to you? Such meanings to smells are given from personal experiences and histories. This is why I chose not to give meanings to smells in this project. I rather want to be open to surprising olfactory experiences that we normally wouldn’t encounter in daily life. 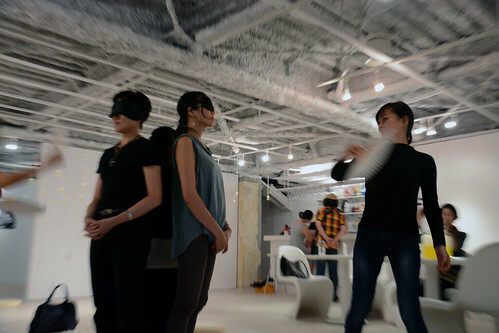 Omni-directional olfactory experience has been forgotten in our modern life, so reviving it is especially interesting. You can become convinced that human beings, much like dogs, have the ability to sniff around and navigate themselves using their sense of smell. In our society it's not considered good manners to talk about smell, but it's recommended to do so here! In recent years my key words have been "movement" and "olfactory experience". 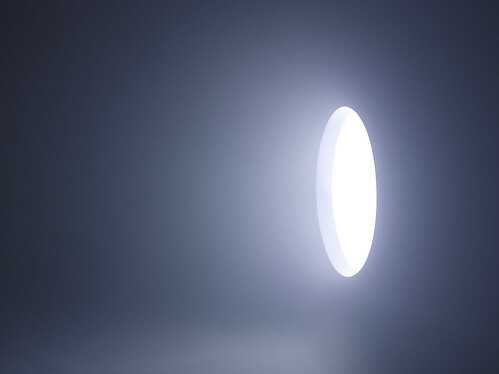 I've been researching omni-directional olfactory experiences within a certain space. The sensations created by actively walking around and finding smells are very different from just passively receiving smells. I think I'm one of the few artists researching this discipline. I’ve wanted to make an "olfactory labyrinth" for years. 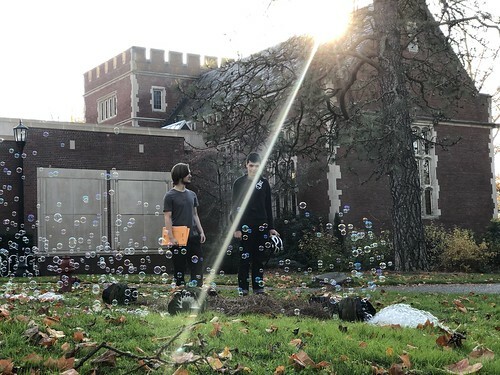 I’ve thought about a big construction in an open space, or an interactive installation with sensors. But I first wanted to experiment at low cost, resulting in this first prototype for future development. I selected the fragrant oils while wondering how to make a finer resolution of smells within a certain space. Without my sponsor Yamamoto Perfumery Co., Ltd. such experimentation would never have been possible. I tried to exclude visual and audible aspects in this work as much as possible. I let the work explain itself rather than doing so in words. Instead smells and space communicate with your physical sensations, allowing you to project images and play sounds in the mind. I believe that smell possesses such power. 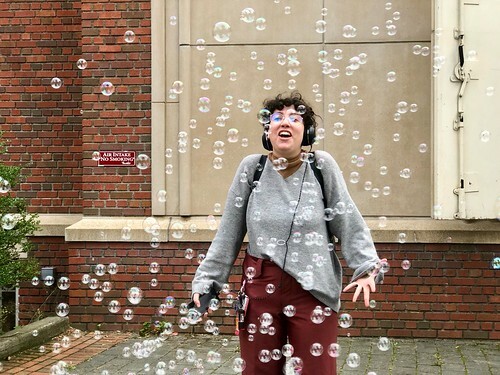 On "Sharing Vibes: As Part of Resonating Place"
“Sharing Vibes” is presented as a place where we may discover the world anew by starting to recall the diverse invisible and immaterial information―odors, water veins, flows, etc.―that we usually cannot sense, or fail to notice. 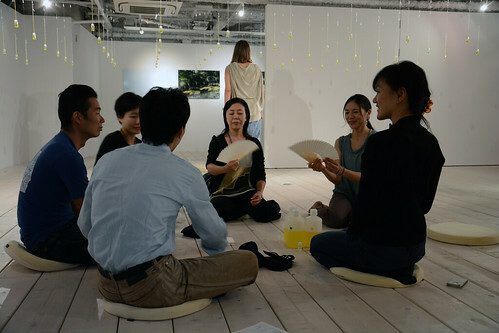 It is in this space that Fuyuki Yamakawa, Maki Ueda and Kenshu Shintsubo will attempt to originate a resonance using, sounds, odors, photography and other media. All three avoid confining their works into distinct media or meanings, and instead regard them as potential information so to prompt us to open up our perceptions and thinking. 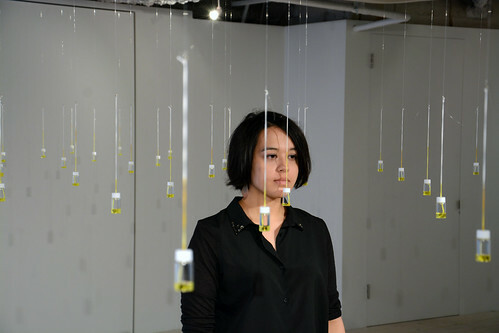 Yamakawa showcases a new work that makes underground water flows audible and visible. 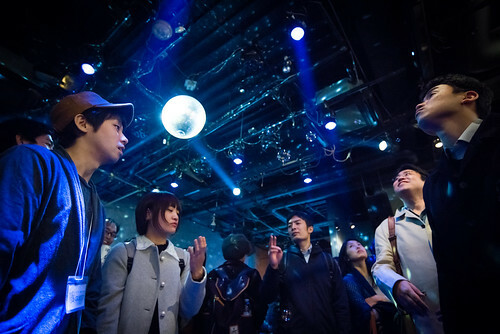 The research he carried out to create this work will also be presented in the form of a portable map that visitors can take with them in order to feel the water veins in Shibuya. 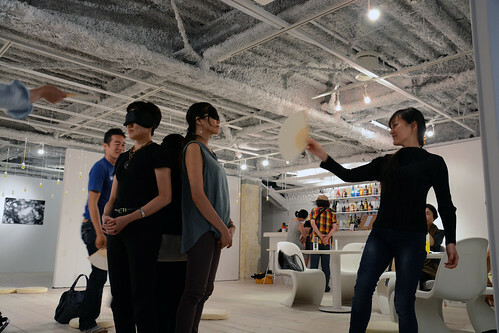 Ueda's “labyrinth” composed of multiple odors is a place where each person gives active attention to the sense of smell. Shintsubo’s works vividly capture the phases of water that circulates the world through the atmosphere and trees. "Search the space like a dog vol.2"
[Premier] 24.03.2015. 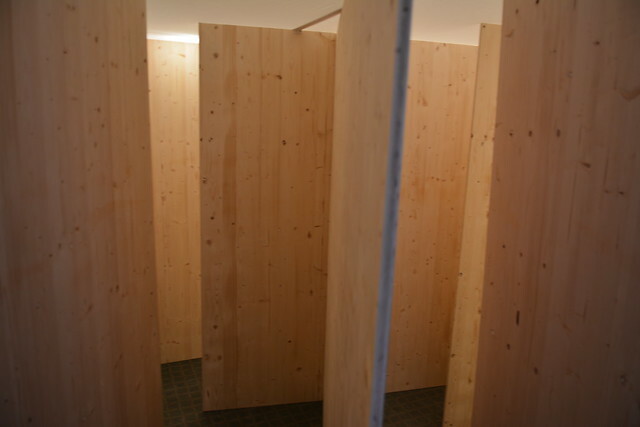 Exhibition"There is something in the air"
[Supported by] Jean Bouis Perfumery Co., Ltd.
"The walls are inpregnated with different woody smells: Cedarwood, Olibanum, Patchouli, and Labdanum. Find the exit by folling one scent that starts from the entrance." 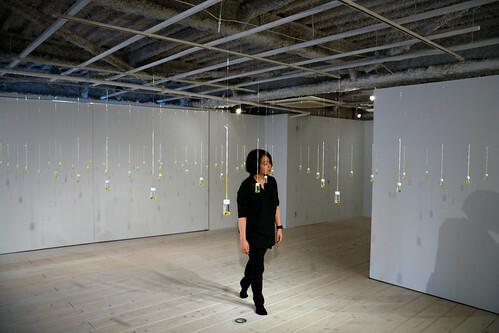 "Tangible Scents" is an open-air installation which uses Maki Ueda's original method of “de-and re-construction in the air” to decode on the scent of rose. 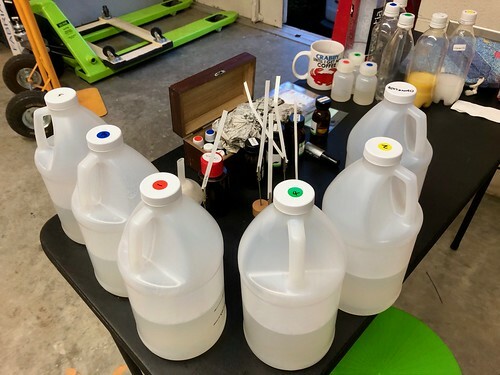 The five major components of the this scent are individually infused into vats of soap, which will each be poured into five different bubble machines. You can deconstruct rose into its component scents by poking the bubbles, or immerse yourself in the total scent. Since the late 2017 I’ve been questioning myself “how to make scents more tangible and understandable for audience?”. I picked “rose” as a theme because it’s universal. There’s no “typical rose scent” but it’s very diverse, from the sweet one to the fresh one, and that fact tells us that “rose” is a concept. 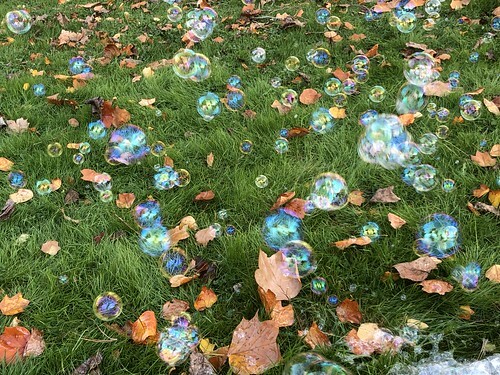 I’ve been experimenting with different medium as candle, perfume, and soap bubbles on this theme. The form of incident varies from workshop to installation. 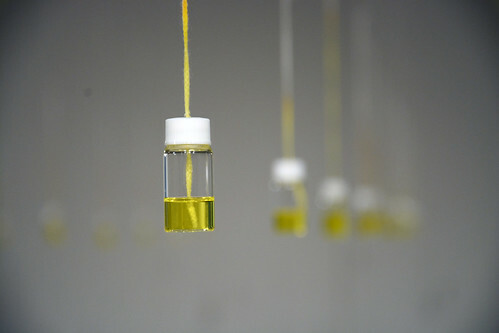 Tangible Scents is an installation in open air, created as a result of such experimentations. My method here is “de-and re-construction of the scent of rose“. 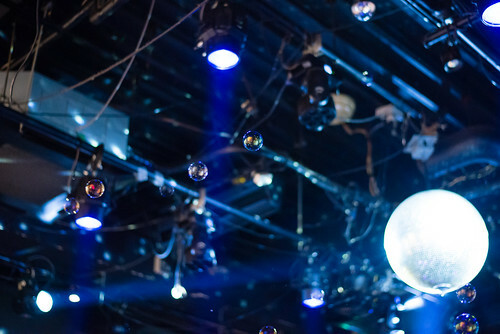 By deconstructing the rose scent in components and then reconstructing them together in the air, its concept becomes more transparent and tangible for the audience. 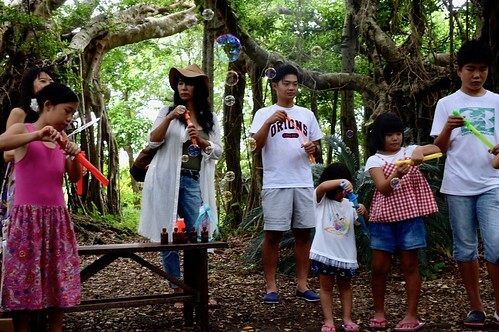 Five scents, the major components of the scent of rose, are impregnated to soap bubble independently. They are to be diffused with the machines independently. - By the mixing nature of scent molecules, the field of “the smell of rose” is created, as if the composition is done in the space. 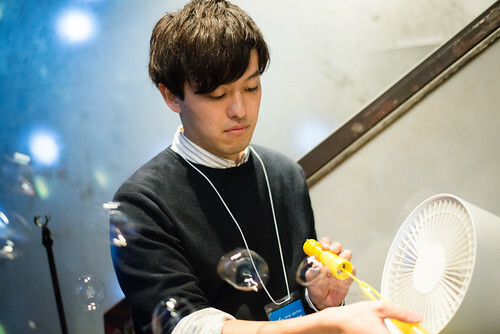 - By being poked, a bubble breaks, and it emits the scent. - You can clearly identify the scent, because the five scents are quite different. 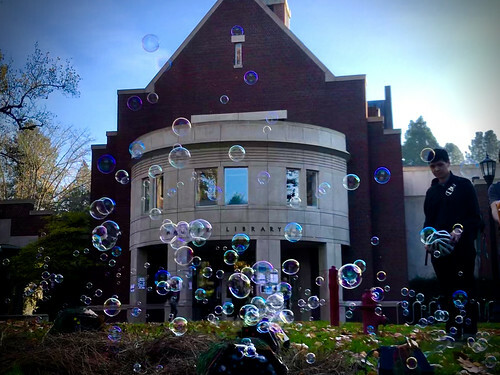 - You can also immerse yourself in the flow of bubbles and just feel the rose. - You can zoom-in and out with the olfaction. - Timing is controlled with remote controllers. [title] DECONSTRUCTING AND CONSTRUCTING THE SMELL "X"